The Electro-Motive Division's GP40 series was the pinnacle of the builder's four-axle locomotives. 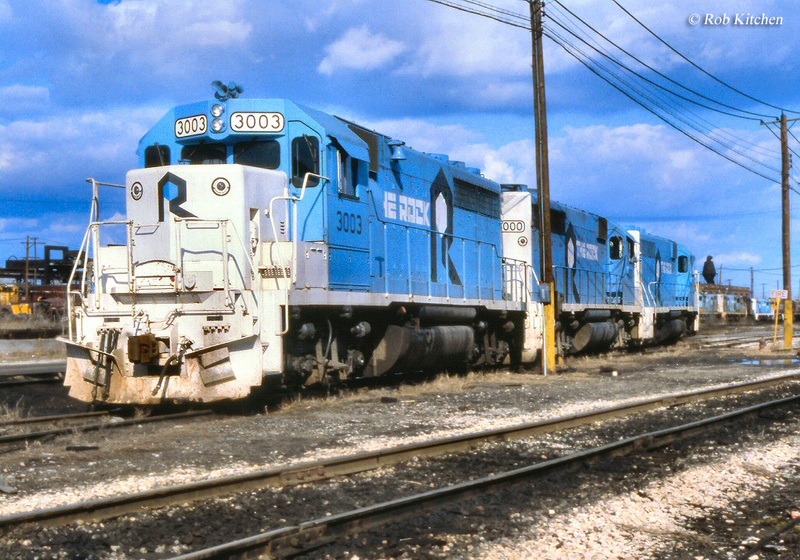 Manufactured between the mid-1960s and mid-1980s the GP40 came in a wide variety of variants, six altogether, although the original design and "Dash 2" were both the most popular selling nearly 2,500 examples between them. 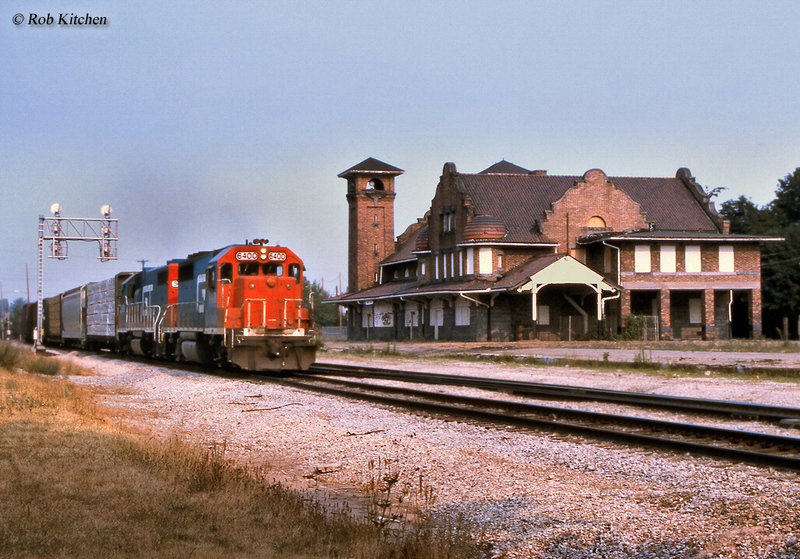 By the 1960s railroads were beginning to understand the usefulness and efficiency of six-axle, C-C locomotives and as such began to purchase more and more, particularly during the 1970s. Unfortunately, for EMD, by the time production had wrapped up on the GP40-2 it was losing an alarming amount of market share to General Electric and before the 1980s had ended would lose first place and to this day remains behind GE. In any event, given the relative young age of some GP40s and the fact that thousands were manufactured many still remain in service on Class Is and can also be found on both shortlines and regionals. 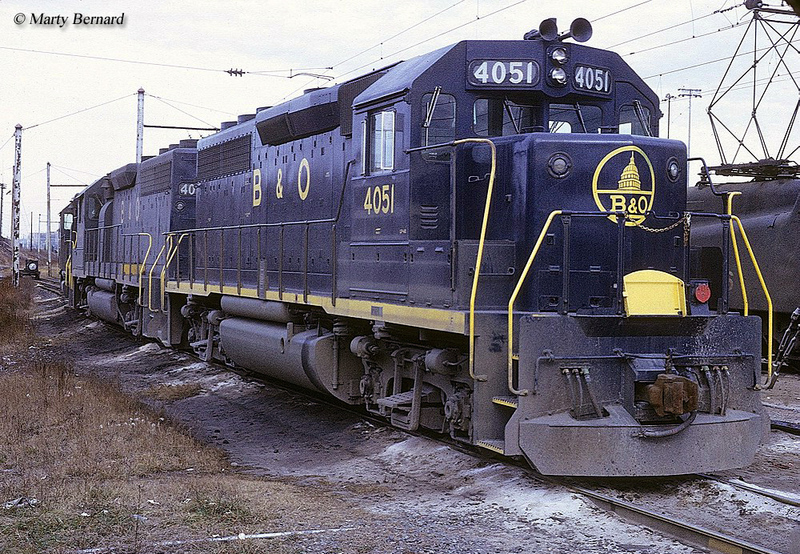 The GP40 and GP40-2 production run lasted over twenty years beginning in 1965 and ceasing in 1987 (the GP40 was last produced in 1971). The units themselves were not that different from GP38s and GP38-2s except that they included some newer technologies; an extra radiator fan, turbocharger stack and an extra 1,000 hp (rated at 3,000 hp over the GP38 series 2,000 hp). The GP40 also included features already now common on earlier models such as dynamic braking (a system for temporarily employing traction motors as generators and using the resulting electromotive force to slow the train), and an airtight hood that kept out dust, dirt and other particles from reaching internal components. The "Dash 2" model is distinguished from the original because of its further upgrades which included things like a newer type of traction motor blower duct, a modular electronic cabinet system and bolted battery box access doors. Essentially, as with all EMD “Dash” models, GP40-2s basically include upgraded electronics and technologies over the original design. 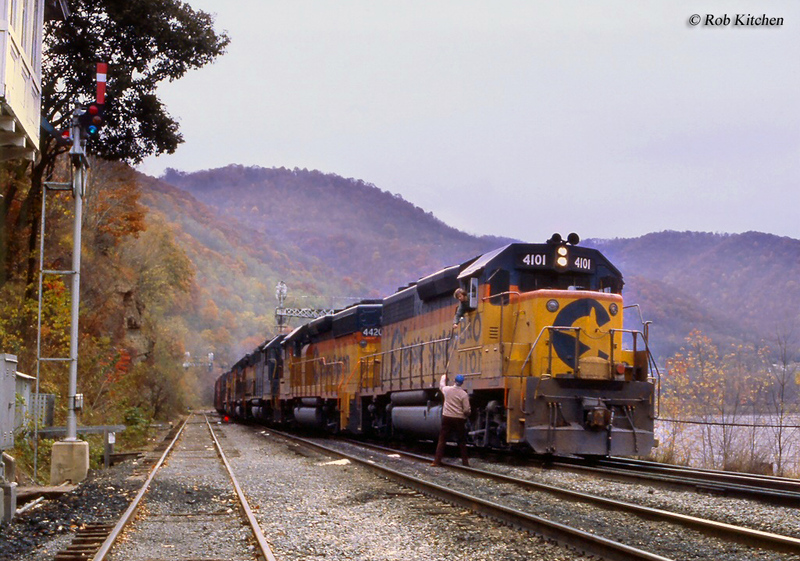 While both the GP40 and GP40-2 offered the same horsepower rating the former was equipped with EMD's model 645E prime mover while the latter featured the 645E3C. Interestingly, the GP40 offered a little better tractive effort (62,500 pounds starting and 54,700 pounds continuous) than its "Dash 2" counterpart although both were very similar in this regard. Also, the GP40 and GP40-2 models were the pinnacle of EMD’s four-axle locomotives in several ways. First, the design was EMD’s most successful second-generation locomotive. Combined GP40s and GP40-2s sold over 2,300 units with the GP40 selling some 1,200+ units and the GP40-2 slightly less at just over 1,100. Second, the model effectively ended production of four-axle power as railroads began to order more and more six-axle units because of their added traction and weight distribution (meaning that with an extra two axles the locomotive’s weight was more evenly distributed over the rails causing less wear on them). Later GP50 and GP60 models were produced but were only marginally success compared to the GP40 and early series. Today, virtually all new locomotives ordered are of the C-C, six-axle variety save for switchers or light duty units. It should be noted that there were several variants of the GP40 aside from the popular "Dash 2". First was the GP40X. This was constructed using EMD's model 645E prime mover and offered extra horsepower of 3,500. It was built only between 1977 and 1978 with four railroads purchasing 23 examples of the model; Santa Fe (3800-3809), Southern Pacific (7200-7201, 7230-7231), Southern (7000-7002), and Union Pacific (9000-9005). The "X" denoted the model as an experimental and the AT&SF and Southern had theirs equipped with Blomberg M trucks while the other lines purchased theirs with HT-B trucks. Another variant was the GP40P built for passenger service and purchased by the New Jersey Department of Transportation in 1968 for use by then Central Railroad of Jersey along its commuter lines. It was three feet longer than a standard GP40 for an added steam generator and 13 in total were constructed. Another passenger model was built by General Motors Diesel for GO Transit of Toronto between November and December, 1966. They used an SD40 frame and wide cab design, featuring HEP equipment for passenger service. A total of eight were constructed (numbered 600-607). There are numerous other GP40 passenger models now in service but these are rebuilds of standard models and were not cataloged directly by EMD or GMD (they include the GP40-2H, GP40PH-2/A/B, GP40FH-2, GP40WH-2, GP40-2W, GP40MC, and GP39H-2). Yet another variant was the GP40P-2 built for the Southern Pacific in November, 1974. This locomotive was 62 feet in length to accommodate a steam generator for use in passenger service and also offered 3,200 horsepower and added tractive effort; 64,000 pounds starting and 54,700 pounds continuous. Three were built (numbered 3197-3199). Finally, there was the GP40-2W and GP40-2LW, built for Canadian National and GO Transit that included the wide cab commonly used in Canada. The models were built between December, 1973 and September, 1975. GO purchased 11 GP40-2Ws (numbered 9808-9814 and 707-710) while CN bought 35 of the model (numbered 9633-9667). Additionally, CN bought another 233 GP40-2LWs (numbered 9400-9632). In any event, GP40s remain as common as railroad spikes out on main lines across the country and you can spot them virtually anywhere as they carry all of the classic EMD features. The GP40 and GP40-2 models, along with the GP38 and GP38-2, were EMD’s most successful second-generation Geeps and like earlier models fit exactly what railroads were looking for in terms of horsepower while also featuring the manufacturers’ excellence in quality and reliability.